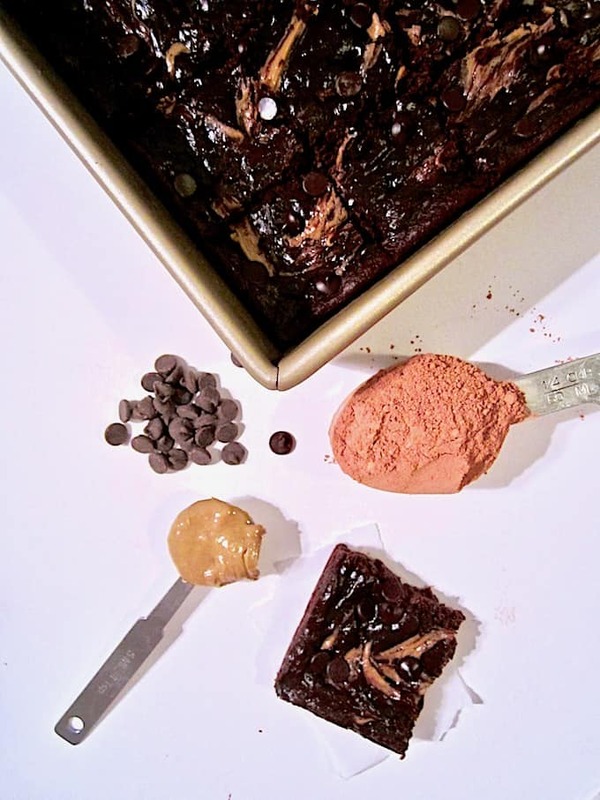 These easy brownies have only 9 ingredients and take 15 minutes to prepare! A low sugar dessert that’s vegan, paleo, refined sugar free, gluten free and oil free! Yeah, that’s right. I said it. Y’ALL. As soon I get back to the Carolinas, that word just slips out of me. I picked it up about 6 years ago when I first moved to North Carolina and was waiting tables. When I was growing up in Virginia near Washington DC, I always considered the word ‘y’all’ to be so quintessential southern and it was never part of my so called ‘sophisticated’ repertoire. Living in northern Virginia, I did NOT consider myself to be southern, even though all my cousins from New York told me and my siblings that we had southern accents. What?! They were the ones with the funny upstate accents and hard ‘A’s in their words! 😉 I always considered my American accent to be totally neutral and non regional. 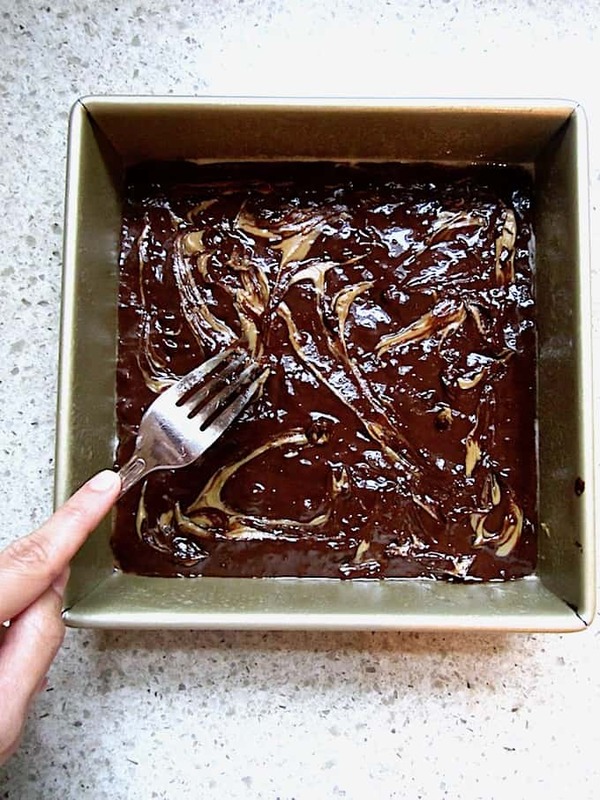 Speaking of simple pleasures, for weeks I wanted to wanted to make sunbutter swirl brownies. Not sure why. It just sounded delicious, and pretty. I mean, these are pretty, aren’t they? 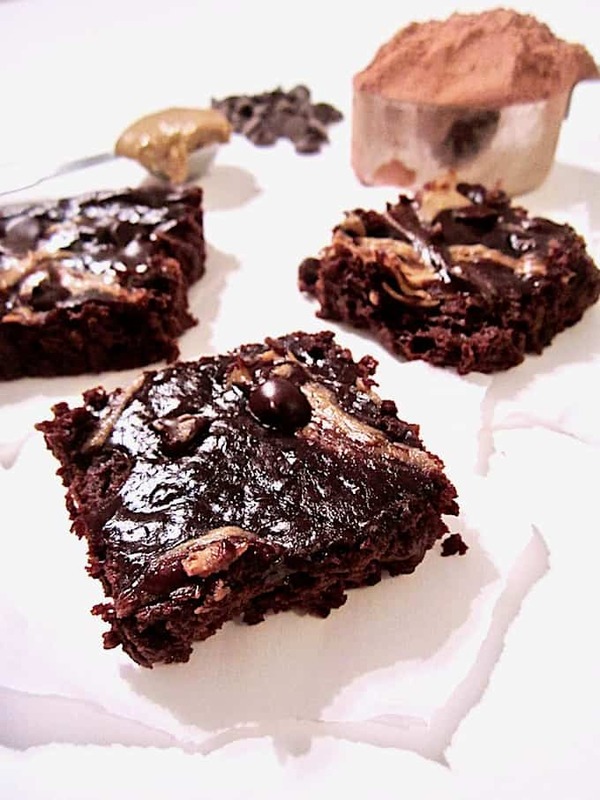 I was tempted to use oat flour in these but really wanted them to be flourless/grain free for my paleo friends, so embraced the challenge of creating a vegan, gluten free, paleo and oil free brownie. Whew! Oh yea, and I wanted to use the least amount of unrefined sugar too, as I’ve been more conscious these days on how much sugar I’m consuming, even if it is unrefined – I still want to use in moderation and only when necessary. One product I recently rediscovered that I fell immediately in love with (again) upon tasting is Lily’s Stevia Sweetened Dark Chocolate Chips . This is not a sponsored post by Lily’s – I just happened to see the brand at a local coop in North Carolina when I was visiting Wilmington, near where I used to live a few years ago. They also have Lily’s chocolate at Whole Foods or on Amazon. These chips are stevia and erythritol sweetened and non GMO. Yes, that means there is NO SUGAR whatsoever in them. SAY WHHAAAAT?! Are you as amazed as I am? I guarantee you will be once you taste Lily’s chocolate – it doesn’t leave that strange aftertaste in your mouth like some other stevia brands do. 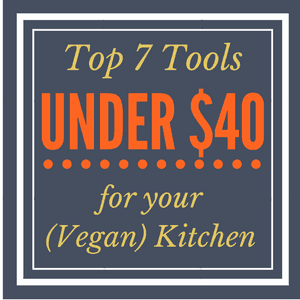 Not all their chocolate bars are vegan, but I know at least the salted almond bar and the chocolate chips are! Happy Memorial Day, y’all, and whip up a batch of these for your weekend picnic festivities! Preheat oven to 350 degrees F / 176 C.
Make your flax egg and let sit for 10 minutes. In a bowl, combine banana, syrup, vanilla and water. Whisk well. Combine cocoa, salt and baking soda. Stir into the wet ingredients and add the flax egg. Mix well. Pour into a non stick or lightly oiled 8 x 8 dish. These brownies are thin, so don't use a larger dish unless you double the recipe, or the batter will be too thin. Using a fork or utensil of your choice, swirl in the sunflower seed butter on top of the batter. 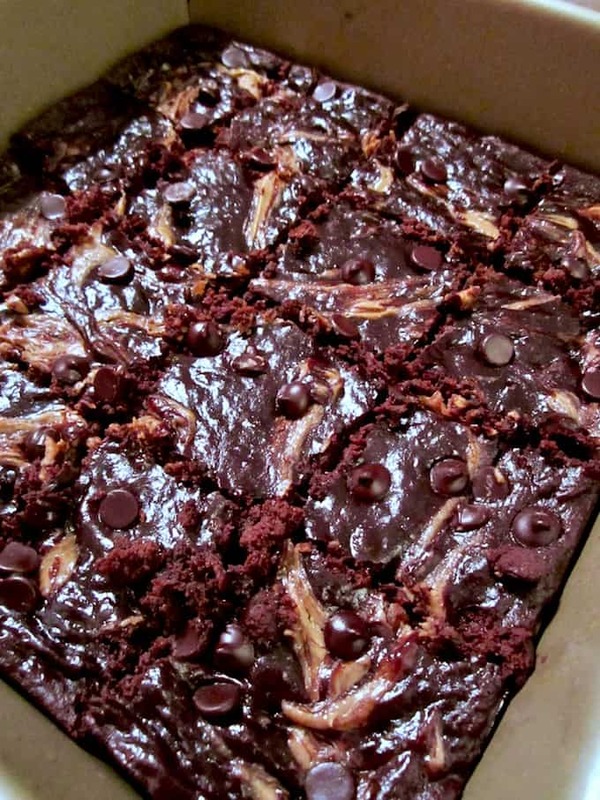 Top with additional chocolate chips if using. Bake for 20 minutes. Let cool. You can substitute any nut or seed butter for the sunflower seed butter. These brownies look amazing! And I love the simple and straight-forward ingredients. 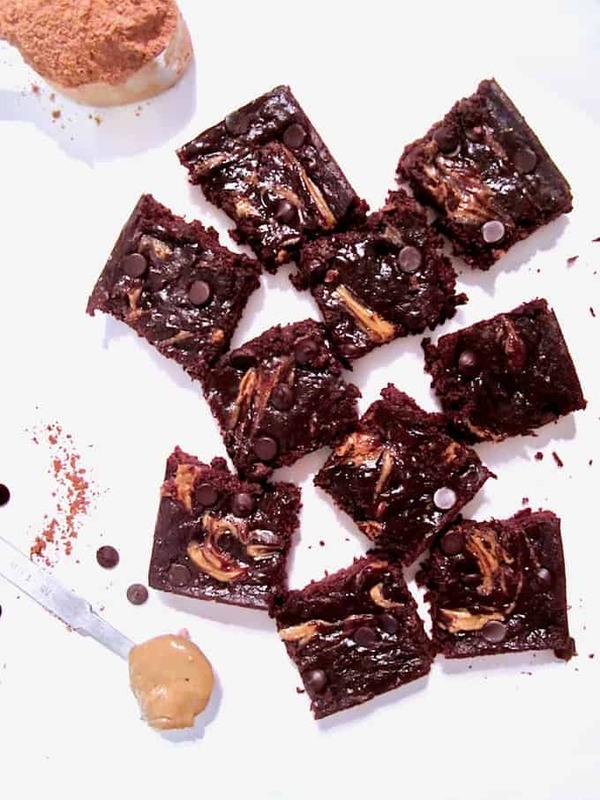 These look so rich and fudgy – my kind of dessert! Great to hear Dianne! Thanks so much for commenting! Can't beat a super gooey and moist brownie! Those look like a great treat! Thanks so much! I agree - gooey, moist and with a touch of crispiness on the edges! Mmm, brownie perfection. Brownies mmm. I have a weakness for sunflower seed. There's something about it. I think I'll really like it with cocoa. 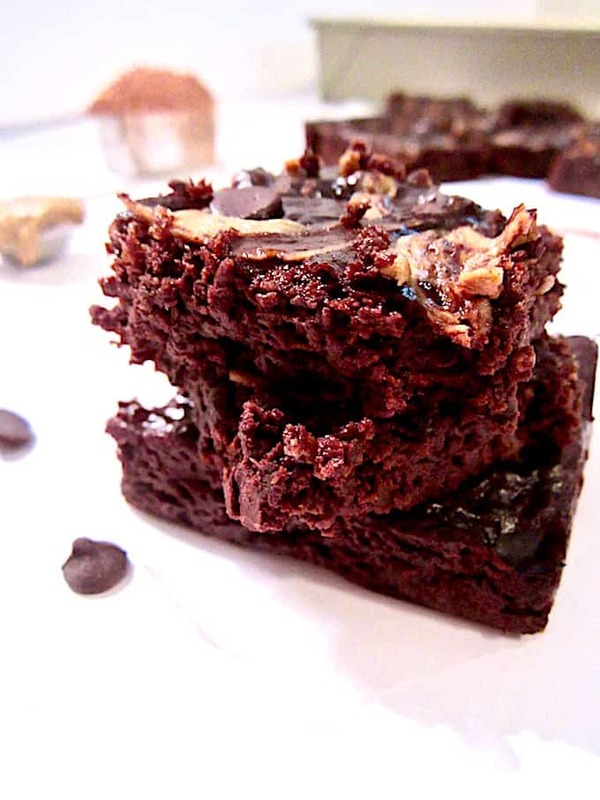 Brownies are one of my fave desserts! They are so soft and gooey and I just want to snuggle up right in there and eat my way out. MMMM. What can I substitute for the banana?